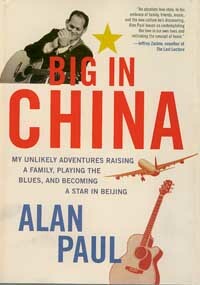 “Big in China: My Unlikely Adventures Raising a Family, Playing the Blues, and Becoming a Star in Beijing” by Alan Paul. Harper Collins Publishers, $25.99, 262 pp. Author Alan Paul's new book is a product of a life's journey for a man from New Jersey. When Paul's wife was offered the position of China bureau chief at the Wall Street Journal, he embraced the opportunity to embark on new experiences. In his book, "Big in China: My Unlikely Adventures Raising a Family, Playing the Blues, and Becoming a Star in Beijing," Paul writes about how his family of five packed up their life to move to Beijing to take on an unforgettable adventure. Paul's book includes his three and a half years as a stay-at-home dad in a foreign land. While in China, he wrote a column, "The Expat Life," for the Wall Street Journal online, which was the basis of his book. Beijing offered Paul opportunities he did not foresee. He fronted the Woodie Alan blues band, which he formed with a Chinese partner—a successful collaboration. Touring across China, the band was dubbed "Best Band in Beijing" and recorded a CD of original music in Mandarin and English. Paul will visit Ketchum on Saturday, July 9, to give a presentation and book signing at Iconoclast Books in Ketchum from 4-6 p.m. In addition, he will perform. For details, call 726-1564.